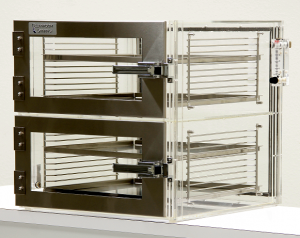 Cleanroom Synergy’s Micron-Aire™ series desiccators are ideal for storage of static and moisture sensitive materials such as micro-electronics, electronic assemblies, anhydrous and hygroscopic biological and chemical compounds that require controlled dry storage conditions. 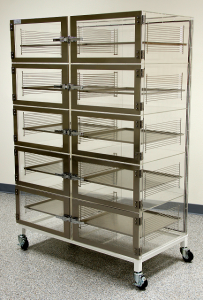 When nitrogen purged, these hermetically sealed acrylic desiccator cabinets can maintain relative humidity levels down to 0%. With our advanced systems of relative humidity control storage conditions can be maintained to your specific set point values, automatically and with minimal nitrogen consumption. The standard materials, system configurations and shelving options allow for storage of most any materials that require clean, dry, static-safe conditions, which reduce product defects and increase yields.